Horton came to us from a Central Texas animal shelter after a good samaritan saw him tossed from a moving vehicle and called for help. It took several weeks before they could catch Horton and although he wanted so badly to trust and come to them he spent a few tough weeks on the streets. He was not using one one of his rear legs and since coming to NASPR and receiving veterinary care it was discovered he had been shot in the leg. Thankfully there was no damage to bone or ligaments and he is now using his leg and enjoys his daily walks. A sweet easy going love bug of a guy! In need of some training, but walks great on lead. Doesn't have a problem with cat's or other dogs. Doesnt like riding in the car but with some care and time, should be ok. He will make some one a great pet ! 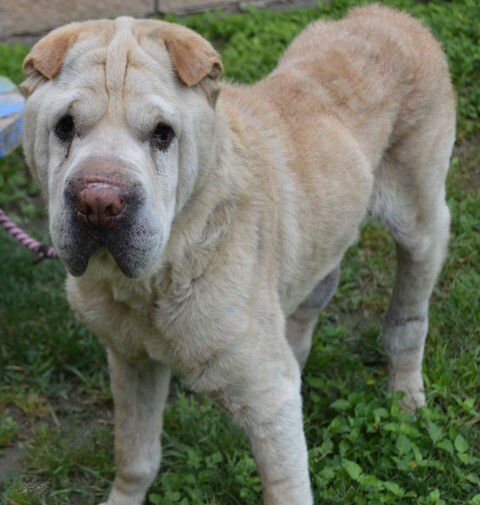 Approx 6 yrs old so very relaxed , not a high energy guy, but loves to go on his daily walks with my other two Pei"s. Horton is heartworm positive and will be starting treatment soon. He will make someone a wonderful companion. Please give Horton a chance to know love and have a family of his own.